Use this 4 cup auto pop-up tray / cup carrier to quickly and easily transport up to 4 carry-out drinks at once. It's perfect for holding smoothies, sodas, slushies, coffees, and milkshakes! Since each corner has a space for one cup, the entire carrier balances out nicely once filled. Then the rest of the cup carrier has tray space to fit your snacks like nachos, fries, pizza, donuts, and other crowd favorites. The auto pop-up design of this carrier allows it to quickly and easily go from flat and folded to a ready-to-use carrier in no time! The corrugated kraft construction is designed to stand up under your heavy foods. Provide this cup carrier at your food truck, concession stand, or movie theater to help your customers get as many treats as they would like! with our place being mostly take outs these carriers are great for our customers. less bulky for their trash plus they store nicely in our small kitchen. We were very disappointed in these to go trays to where we were not able to use them. They are so flimsy they would not securely hold even four small cups of coffee. Thank you for your feedback! 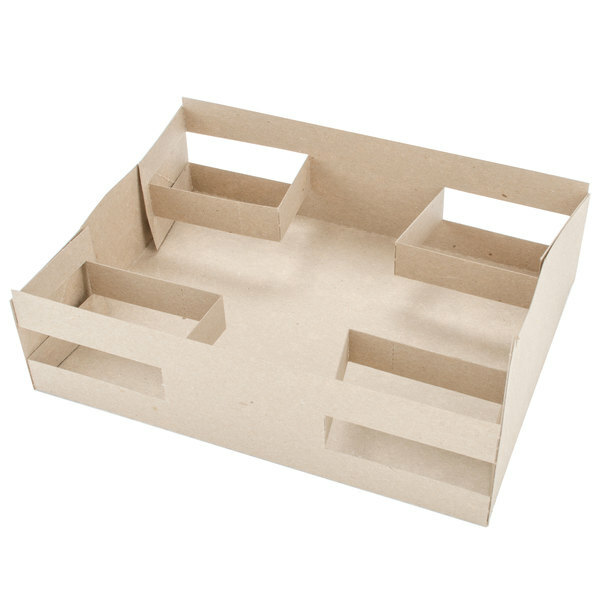 We are sorry your Designers Folding Box Corp. 10AUTO 4 Cup Pop Up Auto Tray Carrier - 250/Case was defective. Corrective action has been taken and a Customer Solutions Representative will remain in contact with you about this. We are a non profit organization always looking for the best price. These trays are not our favorite. They come apart easily when serving food and drinks. Good price but not the best quality. Thank you for your feedback, Jill! We are sorry you did not prefer this product, we recommend trying these Choice Biodegradable Pulp Fiber 4 Cup Carrier instead! Good carrier for the money. 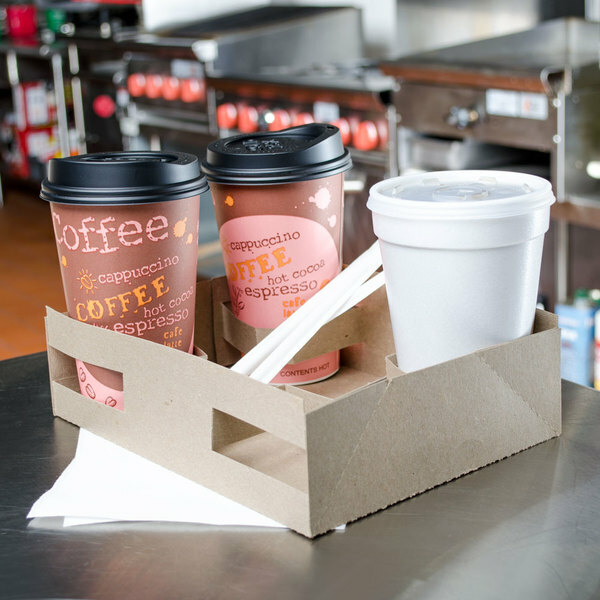 The cup holders hold our short hot cups well but can not hold our tall 24oz drinks without letting them topple easy. We more often use these with the cup holder tabs snapped back to the out side to hold several sandwiches and sides with large orders. They do make a good tray for that but you are safer to carry the tall drinks in your hand. They are a nice item to keep with a takeout mobile unit like ours as a cutesy item for the customers that need one to carry bigger orders. I bought these knowing better but still thought hey give it a try. Boy was I wrong. Definitely spend the extra couple dollars and get solid drink trays. These trays really are a joke. They aren't sturdy at all. Stuck 4 regular sizes water bottles and the just flipped off. Thank you for the review! We're sorry that these carriers did not meet your needs. 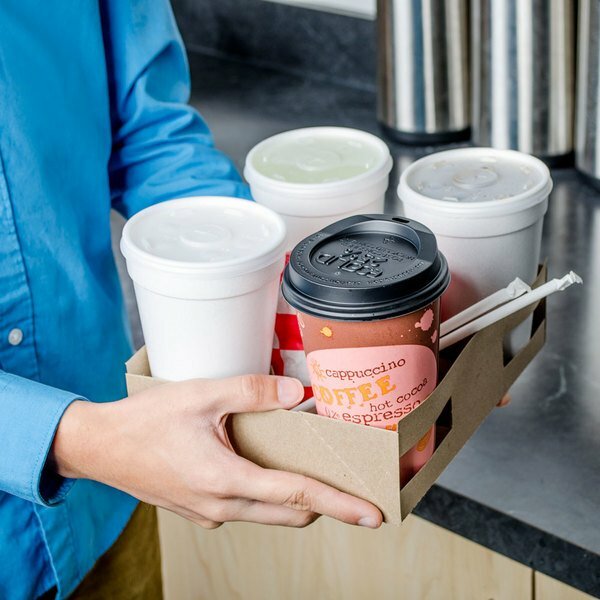 Our experts recommend trying these Choice Biodegradable Pulp Fiber 4 Cup Carriers instead for a sturdier alternative. These trays work very well. Most sturdy than I thought they would be but they do slightly bend. For the price, they're still my go to! First time ordering with this company and so far I can say that they offer great service, quality products, and great prices. I will definitely shop here again. These are perfect! We have movie nights and my youngest daughter had a movie party and these where a big hit! I used them with cups and the small paper craft food trays, and the guests loved them! I will never order these pop up carriers again. They are too light weight to carry much of anything in and threaten to fold up with the least amount of weight in them. Will be happy when all gone. Thank you for your review! We're sorry to hear you did not like these carriers. If you are looking for a heavy duty option, try one of our pulp fiber carriers such as item 433FLUID. these are nice to have for small independently owned coffee shops. they are really well constructed and can easily handle the weight of 4 coffee cups. This 4 Cup Pop Up Carrier is great for carrying out drinks. My restaurant always using this for our smoothie carry outs. These are great for carnivals, concession stands, and even movie nights! The little flaps can come out for up to 4 drinks, and then fold back in to the perimeter for nachos and snacks! exactly what I was looking for. I run a small concessions stand, and this was great not only for drinks, but also great for serving food.